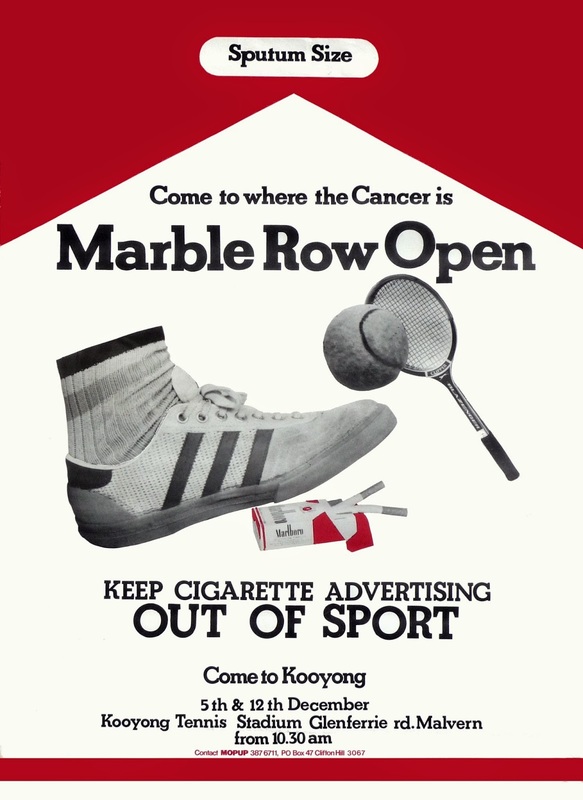 It might be hard for some younger people to imagine, but in the early 1980s the Australian Open tennis tournament (then held at Kooyong Stadium each December) was sponsored by Marlboro cigarettes. In fact, they were the "naming rights" sponsor, and the tournament was widely referred to in the media as the Marlboro Australian Open. Activists and supporters from organisations opposed to tobacco marketing and sponsorship, including Action on Smoking and Health (ASH), the Movement Opposed to the Promotion of Unhealthy Products (MOP-UP) and Billboard-Utilising Graffitists Against Unhealthy Promotions (BUGA UP) organised effective protests on Glenferrie Road opposite the stadium, with a simulated "marble row" of headstones and a giant inflatable cigarette, easily visible from the South Eastern Freeway (now Monash/CityLink). He could still get his ads on the telly. It might even make smoking look healthy." I want McEnroe, Borg, Gerulaitis! But I can't - I've got heart disease, lung cancer, emphysema... and chronic bronchitis." Eventually the Victorian government acted, not only to end tobacco sponsorship of sport, but to fund sporting clubs and healthy activities using revenue collected from tobacco taxes, via the Victorian Health Promotion Foundation (VicHealth), the first of its kind in the world.